A group of people got stuck at the door and couldn’t get it to open, they hit the open button a number of times but nothing happen. Eventually they looked like they were going to give up and get off the train to get to the next carriage. My daughter explained to me that the sensor above the door opened the door not the button as she had seen somebody go through the door by waving their hand in front of the sensor. Did you spot it the first time you looked at the image? I said she should tell the group who was stuck which she did and they dutifully waved a hand in front of the sensor and the door opened letting them through. This repeated itself with about 4–5 other groups or individuals trying to get through the door. Only 1 person I saw walked up to the door and immediately waved their hand in front of the sensor to get through. After studying the door I noticed that the door of the carriage we were in was already open, presumably it was this door that was controlled by the large yellow button. 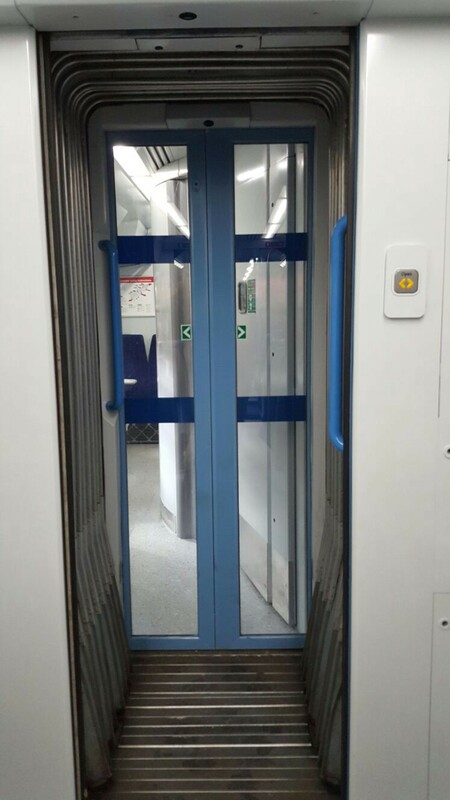 The door to the next carriage was controlled by the overhead sensor. The interesting thing to me in this story is context. The carriage design on its own makes sense. The user experience is simple: walk up to the door, if it’s closed press the obvious big yellow button and it’ll open and let you through, if it’s open just walk through it. But the design, in the context of a train, especially with the door open, is very confusing. People consistently confused the obvious big yellow button as the control to open the door they could see, which was the door to the next carriage and didn’t notice the sensor which was presumably designed to not be obvious. This compounded with the distance that the sensor worked at being way to short meant people literally would have given up attempting something as simple as opening a door. Epic fail for train design. My take away from this is make sure you design in context. In other words if you’re designing a carriage remember that it is probably going to be in a train. Equally test your design in it’s context, not in isolation, otherwise you’ll miss contextual problems.